This 3-page worksheet supporting opinion writing for kids provides a topic and poses questions to help them organise their thoughts and write their opinion. Use this glossary with the EL Support Lesson: Summary Writing with Big Ideas. 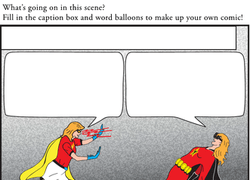 The adventures are up to your fifth grader, as he fills in captions and word bubbles with comic book writing.